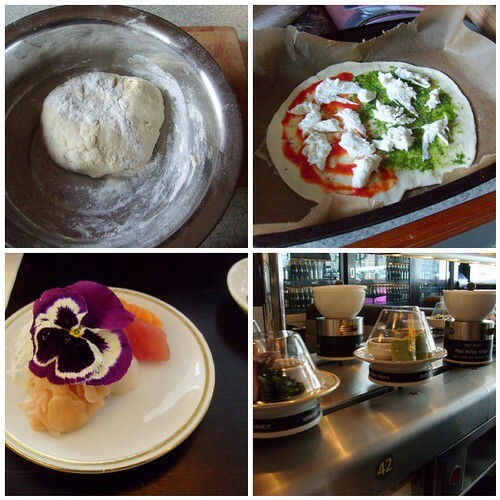 I’ve not yet blogged about pizza, I don’t think, and I should because everyone should try making pizza at home. Since making it myself we’ve never ordered a pizza again. I use this Jamie Oliver recipe. The ‘00‘ flour is a must, it makes a perfect pizza which cooks quickly and comes out beautifully crisp. If you can find semolina flour then use this too, it makes it even better. I don’t like to put too many toppings on my pizza because it really doesn’t need it. This time I went for a combo, homemade pesto (another thing you won’t ever buy again once you’ve made it yourself) and tomato sauce with mozarella on top and lots and lots of black pepper. I attempted to make it a bit healthier with some salad too, I try to do my bit in between the cheese and the dough. On Saturday we went for a probably very unauthentic sushi at Itsu in London. We love the conveyor belt thing, as gimmicky as it is. Still, the fish was very fresh and I had my first taste of raw scallop. I didn’t eat the flower by the way!